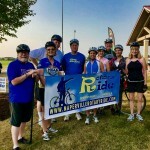 Sunday I participated in the Naperville Rotary Ride 2018. It was a fun cycling event where I was able to ride with my fellow Rotarians. I’m happy to have completed about 35 miles! To my disappointment this year I have only been able to ride a couple of times. The night before the ride I “checked” my bike and felt confident that I could ride about 20 miles. I knew this would be a challenge for me since I had not been riding. I had started with good intentions but made some classic mistakes. I thought I share this with you in hope that you can avoid my errors. 1. Check your bike! Make sure your tire pressure is where it should be. Correct pressure will ensure a smoother ride. I was lucky my friend had checked my tires before I started to ride. 2. Helmet and proper clothing. I never ride without my helmet! Make sure it fits and does not have any cracks. 3. Water bottle. Thankfully I had one. 4. Fuel properly. I did not do this well and was extremely fatigued during my last miles. 5. Train properly. You’ll be happier and safer if you train consistently and are aware of your limits. I struggled the last 10 miles due to improper fueling and training. It felt great to be riding again. I’m looking forward to late summer and autumn rides following these helpful hints.